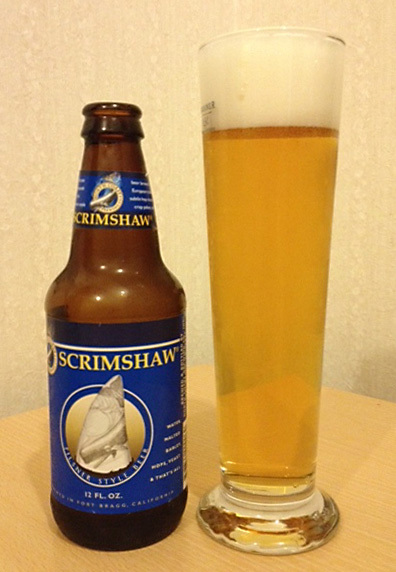 This week’s beer is North Coast’s Scrimshaw German Pilsner. With 22 IBUs (international bittering units)―three points lower than the typical low end for the style―and an ABV of 4.7%, Scrimshaw is a featherweight compared to the previous two full-bodied brews. Nevertheless, there is a time and a place for light beers, and their delicate nature is furthermore an opportunity for brewers to exhibit subtlety and finesse. Pilsners originated in 1842 in the city of Plzeň in the Czech Republic. By using paler malts and bottom-fermenting yeast and storing (or lagering) beers in caves for extended periods, the first Pilsner brewers were able to create a lighter, clearer beer. Its popularity took off immediately and just three decades later, the first German-style Pilsner appeared, adapted to local water sources and using German lager yeast and hop varieties such as Hallertauer, Tettnanger, and Spalt. Like the original Bohemian Pilsners, German Pilsners are typically light gold in hue with a creamy, persistent white head. The aroma should be clean and lightly grainy with flowery, spicy German noble hops. In terms of flavor, they are usually crisp and bitter with hops in the foreground and fairly low-level malt in support. Scrimshaw is made with Munich malt (rather than the more typical Pils malt), which is described as having a nutty, bready, or even toffee-like flavor. German noble hop varieties Hallertauer and Tettnanger are used, both of which serve as finishing varieties, meaning they are added to the boil towards the end so that less of the aromatic oils are lost due to evaporation. Now to give Scrimshaw a try myself. It pours a very clear, pale amber body with a frothy, eggshell-white head. The flowery, sweet, and grainy aroma is clean and mild. As for the flavor, it’s unsurprisingly not very bitter. What is unusual is the predominant malt, which is smooth, sweet, and bready. The hops add a subtle but pleasant touch of spiciness and floweriness. It’s medium-light in body with moderate, frothy carbonation and a good bite. Overall, it’s light but flavorful and refreshing, as a Pilsner ought to be. The hop bitterness and malty sweetness work well together, though the foregrounded malt is a bit surprising, as the style typically showcases the hops rather than the malt. The body isn’t overly light and crisp but rather soft and fizzy with just enough bite to be satisfying. The North Coast Brewing Company was founded in 1988 and is stationed in Fort Bragg, California. It boasts numerous award-winning beers and having had a hand in the pioneering of the craft beer movement in the U.S.
Today’s beer was purchased online from Sake Taniguchi through Rakuten Ichiba. This entry was posted in American Beer, Mad Capper Reviews and tagged North Coast Brewing Company, Pilsner. Bookmark the permalink. At Last, Craft Beer in Takasaki!